Just managed to finish The Sower jut in time for Christmas, after getting a couple of hours every other night for the last month. Between the two of us, we accumulated 355 deaths, and had great laughs along the way. Pretty solid map in my opinion, balancing seemed pretty good, it was only once we got to the final flower room things really went pair-shaped. Much kamikaze creeper-hugging ensued! Edam_Cheese posted a message on [Challenge] Build A Small Compact House! Isn't that technically a 4x4 house? If you used actual blocks for the walls instead of doors, it would be 4x4, but the doors just make it look thinner. 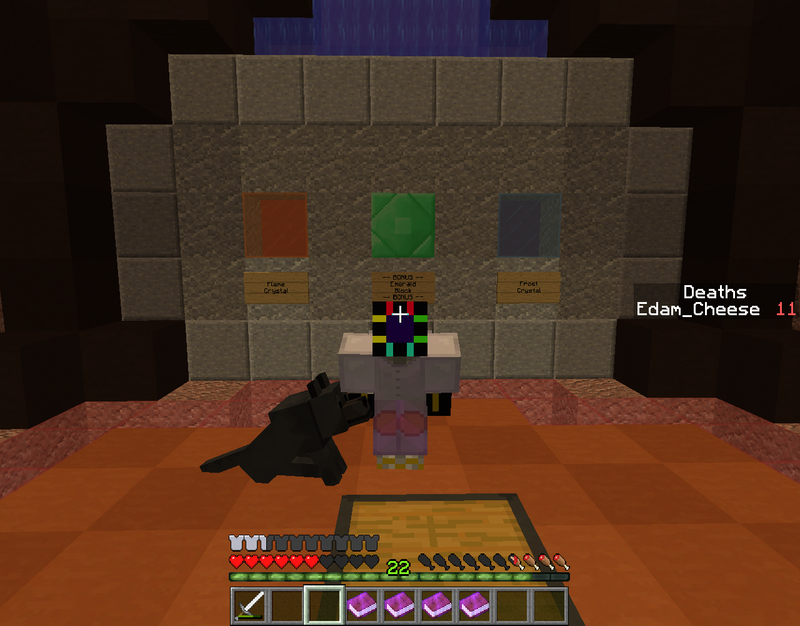 Edam_Cheese posted a message on Strawberry Jam V3 - A CTM Map Building Jam! Jam #17 over - check out the maps! Do you have any ideas on how to create working mob spawners in 1.9? EDIT: The spawners don't work in the 2nd pre-release, but do in the snapshots!... ? Odd. In fact, I wish I'd had as much time as I thought I would have this weekend. A load of stuff cropped up that I hadn't expected (or had forgotten about) and I've had no time at all to make anything. I guess I can always try the final wave, but this weekend was going to be my best bet time-wise. Congrats! You got it! Googling 'Flurry Of Dancing Flames' leads right to him - which I didn't bother to check at the time - so in retrospect that may have been a bit of a giveaway, but still, nice job. The important bit of book 1 is actually the title of the song - Memorize. "Got it memorized?" is pretty much his catchphase. He does also say "So you really do remember me now..." in KH2, but memorize is the big hint here. (As well as me hoping throughing in another game entirely may catch some people out). The book 4 link is a tenuous one, an attempt to link Axel to the song. This is supposed to be reflecting the relationship between Axel & Roxas during KH2. The books are the only things really pointing to Axel specifically, but other parts of the map link to KH as a whole - though I won't mention everything, particually as you've never played or watched the game(s). "The Ressal" is an anagram of "Heartless", one of the main groups of enemies in KH. Two of the area names contain the words "Heart" and "Kingdom" respectively. Kingdom of Frost's castle was based off of Castle Oblivion (run an image search for castle oblivion - you should find it looks similar). There's 1 copy of book 1 - 24 copies of book 2, 5 of book 3 and 12 of book 4. ...the list of stuff goes on. Thanks for playing my map! I'm glad that you enjoyed it and took the time to have a guess at my puzzle. Thanks for the feedback on the main thread as well - and good luck with making your entry. I'll be sure to give it a shot when it's done. Cool! Can't believe I missed the thing with the amount of books, as I've probably shown, codes are something I'm quite good at. Let's hope I have time to make an entry this jam, the theme is almost too good to miss! After finishing the map, and collecting the books, i have some better ideas on this character. but without knowing which letters in the watch code should be caps, I've got no further. EDIT: A quick google fixes the caps and leads me to Remember Me OST soundtrack - Memorize. Remember me is a game from 2013, with many characters in, so my options are spread out again. Just a pair of Roman numerals, 8 and 13. Doesn't mean a lot to me by itself. Finally some proper clues, I quickly recognized this as hexadecimal. I've translated it to 'Flurry of Dancing Flames'. This leads me to Axel from the Kingdom hearts series. He is Rank VIII within Organization XIII, giving meaning to the numbers previously. If you take 'Remember me' at face value, (as those words rather than the game), the clues seem to point to Axel as the character. The 3rd book gives his other name and the 2nd his position. After that it becomes unclear, as I've never played Kingdom hearts. Remember me is possibly something from KH, wikia suggests it could be relevant and similar with Bk4. I wish to delve no further into the plot, as I fear I would butcher it and probably anger some HK fans. For now , Case Closed. Finally got back to this map, after I started it, then went away for a couple of days (I kept on looking forward to it!) and I'm glad to be finished! I quite enjoyed the map as a whole and, taking into account that I'm not very good at CTM's, found it roughly balanced. The wolf mechanic didn't seem to work that well, as you had to hit them first before they tried to kill you. I just ended up taming them for a little help. I also collected all 4 books, but I'll post my musings on your own thread for the map. Only thing I really thought could have been improved was to put some more structures in the forest. After the first outpost, there was only one other building to keep my interest. Just started the map, and so far so good. I've only got as far as the first Guardian tower, but I'm finding it well balanced and quite fun. As for the guessing game, my current theory is something Legend of Zelda, with the fire, forest and water/ice zones. It's nice to see progress here again (with my own exams slowly looming, I completely understand with the break) and I'm looking forward to playing the next version. How are you finding the new command blocks for working with? I'm yet to use them myself, but I can see they would vastly improve and simplify the contraptions. Skeletons and Songs?I don't really understand this theme. The idea is to pick a song and take the lyrics literally, so if it said, I don't know, 'Thunderbolt and lightning' (which is a line in Queen's Bohemian Rhapsody), you'd have to do something with lightening. 'Skeletons and songs' is just a neat name for it. And Fang, can we use Minecraft Parodies of songs instead of the actual songs? A unusual theme, but could be interesting. And as for dates, I'd like to put forward Fri 19th- Sun 21st, although I suspect we'll do it in waves once again. That map is awful compared to the stuff I can make now. My map for the 7th jam was better than Zeus's Failure by a longshot. More and more maps popping up and they're all looking really good, so much so I'm getting excited for my Halloween playthroughs. I'm easily scared anyway, let's see if any of them will keep me awake all night!